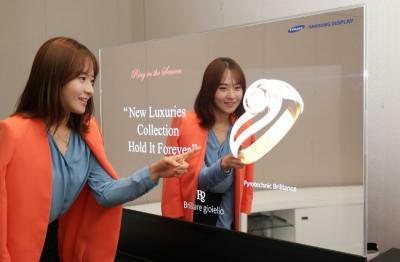 Last month Samsung Display unveiled large-size (55") mirror and transparent OLED display panels, and exhibited those new prototypes in partnership with jewelry company Chow Sang Sang. According to new reports, Samsung now decided to start mass producing those displays by the end of 2015. Those displays will be produced at Samsung's existing A2 AMOLED fab. SDC already secured some customers, including Chow Sang Sang - that has almost 200 jewelry stores in China and Hong Kong. If Samsung will indeed produce such large AMOLEDs at the A2 (Gen-5.5) line, it means that costs will be pretty high as this is a relatively small-sized fab (small substrate) for such a large display. On the other hand it seems reasonable because these displays will probably be very expensive - much more expensive then even a 55" OLED TV. 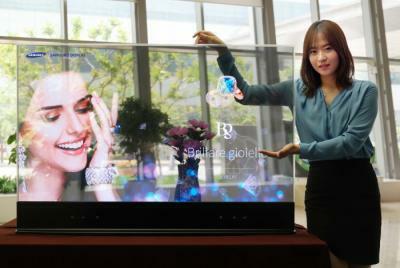 Samsung Display to start making transparent OLEDs for home appliances?